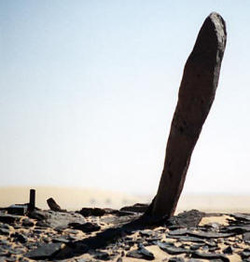 On a desolate plain in the Egyptian Sahara desert, west of Aswan, there is a very remote prehistoric site called Nabta Playa. The site was first discovered in 1974 by a group of scientists headed by Fred Wendorf, an Anthropology Professor from Southern Methodist University in Texas. The team had stopped for a break from their uncomfortable drive from the Libyan border to the Nile Valley when, as Wendorf stated, “we were standing there minding our own business, when we noticed potsherds and other artifacts." About 4,800 years ago there was another climatic change. The African monsoons shifted south to approximately the same area that they were prior to 12,000 years ago. The land became hyper-arid again and caused human habitation at Nabta to cease. The cattle worshipping people of Nabta had to migrate to a more livable area. Although the area was occupied for more then 5,000 years, the majority of the stone structures and other artifacts originated between 7,000 and 6,500 years ago. It was considered by most to be the height of human occupation at Nabta. approximately 70 miles west of Abu Simbel in the south of Egypt. For the past 5,000 years, the region in the Sahara Desert where the site was found has been uninhabitable. The ceramic artifacts that have been recovered are not extensive in number but are considered by Egyptologists to be some of the oldest ever identified on the African Continent. archeoastronomical device (roughly contemporary to the Goseck circle in Germany), about 1000 years older than but comparable to Stonehenge Research suggests that it may have been a prehistoric calendar which accurately marks the summer solstice. Another stone megalithic structure exists which consists of a central radial stone and several other stones in the distance. In interpreting this Brophy found that the lines made to these stones from the radial stone match the spots in the sky where the various stars marked by the center stones in the calendar circle at the time they rose as the vernal equinox heliacal rising. In analyzing the varying distances, mulling through assumptions such as that they represented the brightness of the stars, he inadvertently found that they matched the distance of the stars from Earth on a scale of 1 meter = .799 light years within the margin of error for astronomical distances calculated today. But, as long as there is no technique accessible to Neolithic people known, with which they could have measured the distances to stars, this correlation seems to be nothing more than chance coincidence. The research done by the astrophysicist Thomas G. Brophy suggests that these monoliths might tell much more. The calendar circle itself is made up of one doorway that runs north-south, a second that runs northeast-southwest marking the summer solstice, and six center stones. Brophy's theory proposes first that three of the center stones match the belt of Orion at its minimum tilt and the other three match the shoulder and head stars of Orion at their maximum tilt. This cycle repeats approximately every 25,000 years, following the precession of the equinoxes. The last minimum of Orion's belt occurred between 6400 BC and 4900 BC, matching the radio-carbon dating of campfires around the circle.